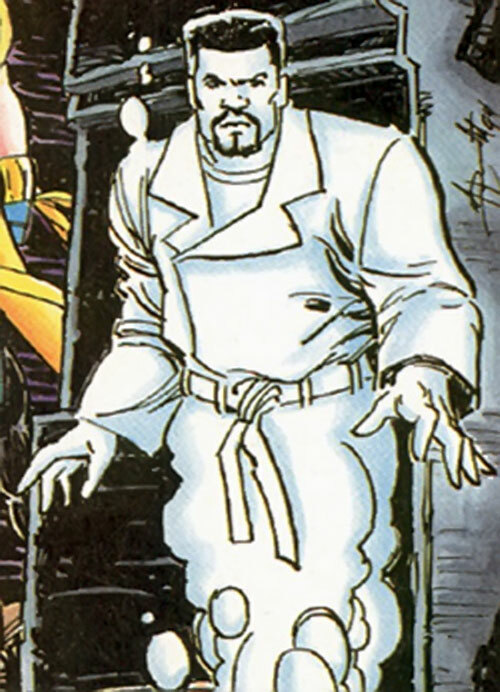 Fade was a major character in Milestone Comics’ Blood Syndicate. This book was part of the Milestone launch in 1993. Part of the Milestone brand was to have more super-heroes who aren’t wealthy White men. 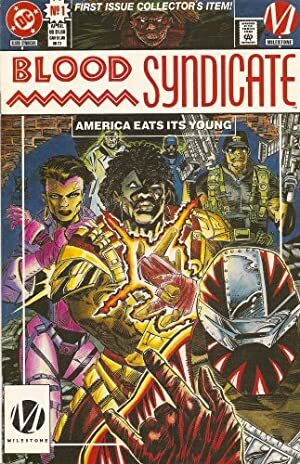 Thus, Blood Syndicate members gained their abilities due to an experimental gas used in the streets of a minorities-majority American city, Dakota. This type of superhuman is colloquially called “Bang Babies”. Real Name: Carlos Quinones, Jr.. Known Relatives: Carlos Quinones, Sr. (Father), Mr. Quinones (Uncle), Sara Quinones a.k.a. Flashback (Sister). Group Affiliation: The Blood Syndicate. Base Of Operations: Paris Island, Dakota City, midwestern US. Whereas most objects exist at one point in time, Fade exists as a wave packet. He’s spread out over a period of three seconds. Thus, Fade is semi-transparent and intangible unless he concentrates. This also gives him a limited form of precognition (in DC Heroes RPG terms, Danger Sense) and the ability to attack while dispersed, albeit with a delayed effect. Fade is a Bang Baby. That is, a gang member who received superhuman powers in the wake of the Big Bang. The Big Bang was supposed to be a rumble between all of the major gangs of Paris Island to settle their turf wars, once and for all. Instead, most of those exposed to the tear gas died. And the handful of surviving gang members that lived had all developed superhuman abilities. One of the Bang Babies, Rolando Texador, took the name Tech-9 after his favorite type of pistol. He gathered his fellow survivors together with a proposal. Tech-9 wanted to form a new gang, the Blood Syndicate, with the aim of achieving substantive positive social change. They took over an abandoned door factory, which they simply dubbed The Factory. Operating from The Factory, the Blood Syndicate smashed crack houses throughout Paris Island. They were trying to rid the neighborhood of the dealers while taking the money captured in these operations to fund their activities. In the course of their work they would acquire new members, and put an end to many threats in Paris Island. Fade and his sister Flashback were two of Tech-9’s first recruits. Fade’s time with the Blood Syndicate was emotionally turbulent. He was trying to rebuild his relationship with his father, with whom he was estranged. Carlos was also watching out for his sister, who was struggling with an addiction to crack. And all the while, he was trying to come to terms with his sexuality and the fact that he slowly fading away. One of the Blood Syndicate’s greatest enemies was the Demon Fox. After numerous battles, the Blood Syndicate finally defeated the Demon Fox at the cost of Syndicate member Kwai’s life. After this final battle, the Blood Syndicate disbanded and went back to their separate lives. In the wake of the original Syndicate’s disbanding, former Syndicate member-turned-criminal Holocaust began forming a new Blood Syndicate that was more sympathetic to his schemes. He recruited several villainous Bang Babies as well as some former members of the first Syndicate. He then arranged a confrontation with Icon to remove that hero as an obstacle to his plans. This became Holocaust’s ultimate undoing. Icon had brought Hardware, Static, and Rocket as backup. One of Holocaust’s new recruits was an undercover federal agent. And all of the members of the previous Syndicate who had joined had only done so to uncover Holocaust’s plots and partners. With the rest of the original Blood Syndicate also arriving to support their friends, Holocaust’s crew was quickly subdued and taken into custody. In a last ditch dominance play, Holocaust challenged Wise Son to a one-on-one duel for leadership of the Blood Syndicate. Wise Son agreed and capably battered Holocaust. Frustrated, Holocaust grappled Wise Son and pushed his powers to the limit. The conflagration consumed Holocaust, leaving naught but a skeleton behind, while leaving Wise Son unharmed. Having earned the Blood Syndicate’s respect anew, Wise Son took leadership of the reformed team with a promise to focus on fighting for justice. One result of the Final Crisis series was the integration of the Milestone Universe into the mainstream DCU. The cataclysmic events therein destroyed the universe in which Milestone took place but the powerful psychic Dharma was able to harness the power of Rift, the powerful being behind the original Milestone/DC crossover, to save his universe’s inhabitants. The only people currently aware of the transition are Icon, Superman, and Dharma. Icon and Superman have agreed to keep the secret and help Dharma when necessary to complete the interweaving of realities. This process was hindered by Starbreaker’s attempt to steal Dharma’s powers and is thus on-going. Dharma stated that it would be months, if not years, before it was complete. This was likely also a metatextual statement on the incorporation of the Milestone characters into DC Comics’ mainstream titles. As of this writing (February 2010) it is unclear what alterations to the Blood Syndicate’s history may have occurred as a result of the merging. Fade is a handsome Hispanic man with a neatly trimmed goatee and flattop haircut. He tended to wear white suits with a white trench coat. The frustrations of trying to take care of his sister. His guilt over friends whom he was not able to protect. His struggles to accept his homosexuality. Fade’s altruistic nature is readily apparent to those who spend any time with him. Icon believed that of all the Blood Syndicate members, Fade had the most potential to be a hero. The Big Bang and the Blood Syndicate can dropped into any urban area where gang activity plays a major role. 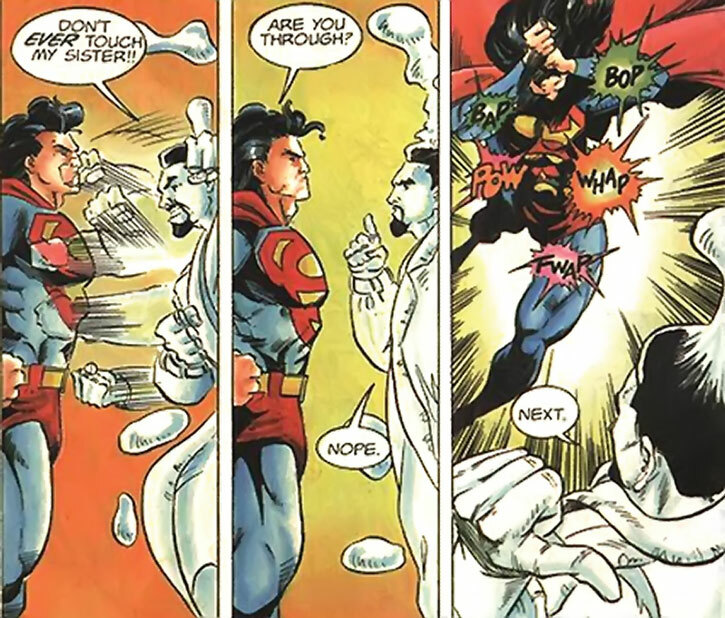 Fade and his sister Flashback could be encountered individually, perhaps as metahumans who acquired their powers during one of DC’s numerous temporal disturbances (The Crisis, Zero Hour, the upcoming Crisis in Hypertime , etc.). All Powers are Contingent on Dispersal (-1FC each). Dispersal (and the other Powers) represents Fade being “stretched out” over three seconds of time. This means that Fade can make standard Physical Attacks while Dispersed but RAPs are not applied until the beginning of the next round (+4FC). Dispersal can be affected by any Powers that affect time (-1FC). Dispersal is Always On unless Fade concentrates. That takes an Automatic Action each turn he wishes to remain solid (-1FC). Area Knowledge (Paris Island), Expansive headquarters (The Factory, though the Blood Syndicate may have a new base of operations after its disbanding and subsequent reformation), Language (Spanish), Sharp Eye. Flashback (High), Blood Syndicate (High). Miscellaneous (Because he is using his mind to hold himself together to some extent, attacks doing Mental Damage also do Physical Damage to Fade, 20 points). Miscellaneous (Fade treats his homosexuality as a Dark Secret, though the results of being exposed would probably not be quite so dire). Fade’s dispersal is a cumulative process, growing a little more every day. If you wish to represent this gradual fading in a campaign, have Fade make an attack once each day with half of his current Dispersal score, rounded down, as AV/EV and his MIND as OV/RV. Any RAPs he takes as a result are added to the *HPs* of Dispersal. When he reaches enough HPs to raise Dispersal to the next AP level, apply them and continue. When Fade reaches Dispersal: 18, he will completely and permanently dissipate. Fade cannot use HPs to boost his OV/RV or for Last Ditch Defense when making his daily roll. Due to the temporal nature of Fade’s powers, he occasionally has Power Complication Subplots relating to time. These often involved him returning to his past, albeit in a completely incorporeal and invisible form where he is naught but a helpless observer. By Kynn Bartlett, JD, and Roy Cowan. Source of Character: Milestone Imprint, DC Comics. Helper(s): David J Oakes, The Milestone Rave (defunct).